Being a good jazz vocalist isn’t easy, and simply releasing a CD doesn’t prove competence. More than some genres, a voice that’s technically good is almost a requirement. There are exceptions, but in this particular genre you don’t find too many with an instrument like Leonard Cohen’s. There’s also the question of material. When it comes to the Great American Songbook, it’s hard to give a fresh spin to tunes that were already popular in the first half of the 20th Century and never faded into obscurity. Usually the fault lies in the interpretations rather than the choices, with musicians creating uninspired arrangements of obvious material in a sad effort to seem relevant. Giacomo Gates avoids all of these pitfalls. He has a warm, intimate sound with the technical chops to do whatever he wants to with his voice and benefits from tasteful and uncluttered arrangements that allow him to draw in the listener with ingratiating humor, emotional insight, subtlety and exemplary musicianship. 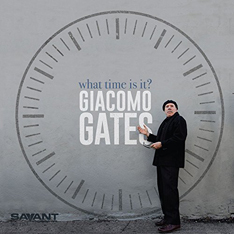 With John di Martino at the piano and Jerry Weldon’s tenor sax out in front, the results never feel stilted and in fact Gates comes across as one of the most distinctive singers on the scene. His unique sense of phrasing and insinuating manner of delivering lyrics to songs like “On a Misty Night,” “I Didn’t Know What Time It Was,” and “A Few Bucks Ahead” help assure him a place among today’s top vocalists.